Fashion, Well Done: I'M ARMED! I'm one of those girls that doesn't wear a lot of jewellery, it is all just a little bit too girly for me - it makes me feel too feminine I think and my inner tomboy rebels. But my mind is swaying a little bit with the emergence of stacked bracelets - it takes away the overly ladylike feel of jewellery and gives it a tougher edge, which is something I can get on board with (if I can get said bracelets to stay on my matchstick wrists that is). I love how heavily stacking bracelets can transform a pair of jeans and a simple white tee into a statement outfit that is uniquely you thanks to you combination of bracelets and bangles. I have styled you up a few looks to show you what I mean - the first is something that I would definitely go for, ripped jeans, slubby tee, pair of leopard flats and tons of tough, punky jewellery. Spike Stretch Bracelet, OASAP; Multi-level Spike Bracelet, Romwe; Gold Tone Spike Bangles, River Island; Gold & Cream Spike Bracelet, Matalan. Curve Hem Tank, Topshop; Ripped Denim Turn Up Jean, New Look; Rivet Embellished Flats, OASAP. Verna Studded Rubber Bracelet, Missguided; Cross on Chord Bracelet, Topshop; Peace Charm Bracelet, Tesco; Silver Cuff; H&M; Studded Wrap Bracelet, New Look. The second look I went for was just a little bit boho, with kick-flare jeans, simple cropped tee and lots of boho, hippy chic arm candy...It's not something I would usually go for, but I have to admit that I love it, once my self imposed spending ban ends on my birthday (6th of July peeps, just a week to go), I am going to go bangle bonkers! 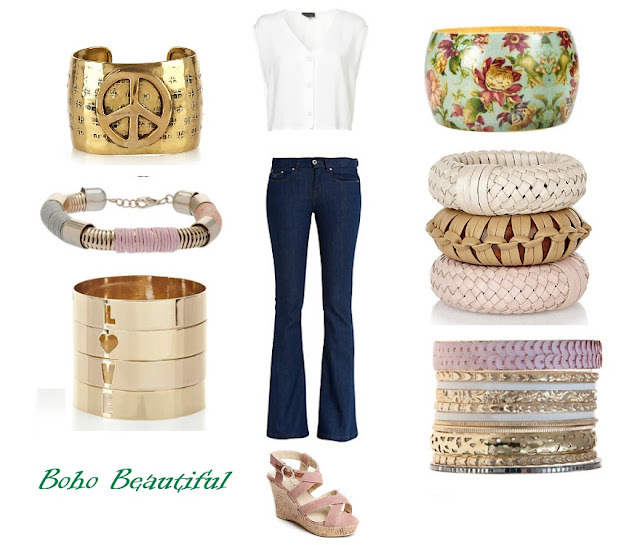 Gold Peace Sign Cuff, River Island; Thread Wrap Bracelet, Miss Selfridge; Gold Love Bangles, River Island. Button Crop Top, Topshop; Firetrap Blue Jenni Flare Jeans, New Look; Vintage Openwork Wrapped Wedges; OASAP. Floral Printed Bracelet, Romwe; Leather Woven Bangle Pack, River Island; Sequinned Bangles, New Look. What do you think of the stacked bracelet trend? Do you love it as much as me? In the spirit of trying new things, I couldn't let you go without showing you a picture of my first ever Creepers - awesome online brand OASAP kindly credited my account with $10 so they went straight towards an amazing pair of their creepers. I went for the Casual Leopard Lace-up Creepers in the stunning green shade, I seriously can't wait for them to arrive - thank you OASAP, expect an outfit post soon! I hope all my UK friends survived the storms yesterday - it was scary huh? My boyfriend's mum is digging out her old biker jewellery for me, I'm so excited! You're welcome Piia, thank you for your visits here. Gorgeous jewelry pieces - love that heart ring! great post I love the red heart ring! I love jewellery although I'm into the less is more thing. I pile it on. Bracelets are my favourite. I have so many. I haven't stopped wearing the bracelet I won here, except when I was ironing, it got in the way! I'm gonna start piling it on for summer, you could make so many looks just by changing your jewellery! I know, I totally want them all! Yeah it's great isn't it. I want everything on the casual edge look! Well I think I am actually going to get those New Look Jeans to go with the shoes! agreed! i love the stacking bracelets look! I really can't wait until my self-imposed spending ban is over so I can load up on stack-able bracelets. I love your blog and bracelets too haha! :D Thanks for commenting my blog! Oh by the way can I just say you mentioned that you wear the extension all the time do you find they give you a headache. I have not wore mine much yet as I only recently got them but they are slightly heavy! Yeah they did at first until I learned not to clip them in so tight! bracelets and rings are the best way to make any look go from good to great! Thats what I'm starting to think, I just need to stock up on some great ones! 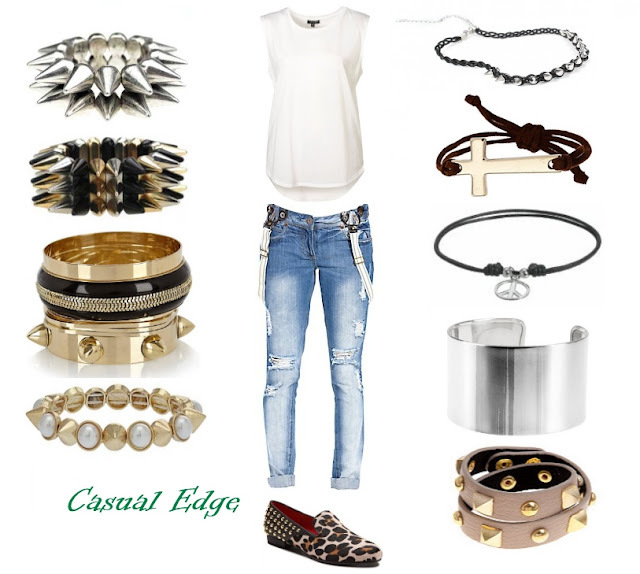 I love the Casual Edge, I want those jeans haha! I so want the jeans too, I think I might just get them, it is my birthday on Friday! ripped jeans and a wifebeater. it's practically my uniform. lovely post. I'm so going to get those jeans, I really love them! You can't beat a bit of arm candy :) I love the gold and cream spiked bracelet from Matalan, will be looking out for that! After such a positive response from this post I'm definitely going to get some serious arm candy on the go! The storms were a bit scary yes I have to admit! Stuck indoors for ours terrified I was going to die. And yes, I'm not one for loads of bracelets and things per se but cuffs...oh I do love a good cuff me. Probably would gladly empty my bank balance for everything in the casual edge collage! Love! I have no arm candy, I always think it will look ridiculous on my spindly wrists, but I'm gonna load up on it anyway! I would love to have all those bracelets!!! But with my tiny wrists it is really hard to find the right one! !